This weekend the Yavin IV project was officially lost. We launched from just outside Delano, MN at 4:00pm, it travelled SW for a few miles before catching the NE bound jet stream. We got a final position location around 5:30pm and it appeared it had landed in a corn field just west of the St. Croix river in Taylors Falls, MN. A few shots of the location information we had via Loopt/Google Maps. We searched around in the dark for about an hour and a half on our own before knocking on the closest door and then heading out into the fields with some friendly hunters and their high powered spot light. Again, nothing to be found. Not even the faint glimmer of our flashing LED beacons. Nowhere. We gave up around 9:00 and headed back to the city. The hunters apparently spend every weekend out there, and they’re keeping their eyes peeled for it and have our contact info if they find it. I checked back in on Sunday afternoon, walked around for a bit in the daylight and scanned the surrounding fields. Ran into the hunters again and they said that hadn’t seen anything either. So hopefully they’ll find it one of these days, or a good citizen of Taylors Falls will be wandering in the Interstate Park and stumble across it. Either way, fingers are crossed it returns one day. Here’s the last video footage of the little guy as he heads out on his last adventure. Lastly, our estimated flight path based on the few Loopt checkins we got after launch and at the landing location. I also denoted the area searched. Click for more. 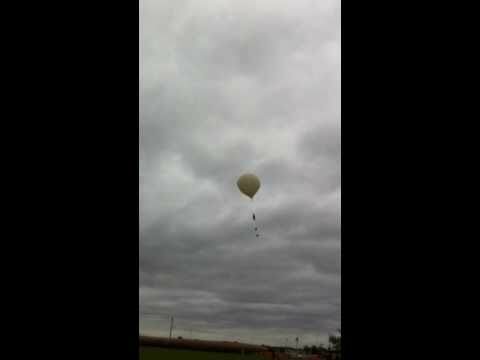 This weekend we sent another balloon up. It was a beautiful day, a little hazy we discovered, but we had a pretty great flight. We hit approximately 90,000 feet and traveled 80.9 miles straight east just past Eau Claire, WI. Hard to predict what our elevation profile looks like, as looking at the aerial cam we hung over Menomonie, WI for about 10-15 minutes and just went straight up, as the city remained directly below and just got smaller and smaller. So our elevation definitely was not a nice curved path up and down. Our burst happened just east of Monomonie and it then traveled 20+ miles east to land just NE of Eau Claire. A combination of elevation estimating, since our GPS cuts our elevation at 30,000 ft, and overlaying our photos in Google Earth to get their “Elevation View” we can safely say we hit at least 90,000 ft up. So that’s great news. We had a little problem with the camera blurring at the real high altitudes. Not sure what happened there. 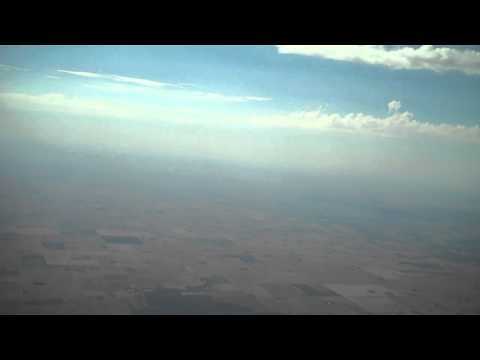 Looks like there were some pretty high wind speeds during some of the higher parts of the flight, but that doesn’t explain the blurry shots near max altitude, as the downward facing cam shows us not moving over Menomonie, but the side cam had a hard time focusing. So we’ll have to try again, right? Always another excuse to send one up! Either way, here’s photos from this weekend. Great stuff indeed. Special Thanks to my Uncle, Randy Erickson for shooting some shots as we got ready. So where do I begin. Lets start at the beginning. Everything really went off without a hitch, as far as the launch goes. We launched outside of Medford, MN with the intention of landing just east of the Mississippi River near Winona, MN. No winds this time, balloon filled no problem, a little less lift than we’d liked, but hey, not a deal breaker. The balloon took off and was headed South East as anticipated, so we headed towards Rochester on our way to Winona. Stopped in Kasson (outside my, (Jamey), hometown) to grab a bite to eat and were quickly disrupted as we discovered our payload was already down… just 15 miles NORTH of where we launched from. Didn’t make a lot of sense, but considering what the Jet Stream was doing that day, wasn’t completely surprising if the balloon burst early or something. So we trekked back north west to where the balloon was supposed to be. Tracking showed it was just off the road outside of a town called Nerstrand, MN. We spent well over three hours searching the woods… wasn’t there. Was nowhere. We were at a complete loss, as the GPS had never led us astray before. The woods were thick and muddy, we were scratched and sweaty, so we called off our search and headed home. Sometime after dinner we got the itch to head back over, now that it was dark, and see if we could see the flashing beacon anywhere in the woods or surrounding corn fields. The rest was us exchanging info for a meetup in Red Wing. But HOLY CRAP! We were WAY OFF! What we later learned by looking at the flight path/elevation map from the handheld GPS was that not only did it not travel the direction we thought it would, it flew up to about 12,000 ft, then dropped quite considerably to about 5,000-6,000 ft (right over where we thought it’d landed) and must’ve picked up a cell signal and sent location. We had no idea it was going to stay up for just under 5 hours, so we thought for sure it was down, not still ascending on its way to Red Wing. So we met with Mike over in Red Wing and got our little guy back. We’re ever so grateful for his help on this. We really had NO idea where it’d gone and without his call, we’d have lost it forever. Mike, if you’re reading this, we can’t thank you enough. You saved the future of this fun little project! So, the bad news of it all was that the cameras died about 2.5 hours into the flight. Obviously they’ve always covered the 2-2.25 hour flights we’ve had in the past. So sadly we didn’t get anything from WAY up, but we DID get some amazing photos along with some shots of the Minneapolis Skyline and MSP Airport. Some video from the flight is below as well. Official Launch – We did it! Wow. What a day it was. 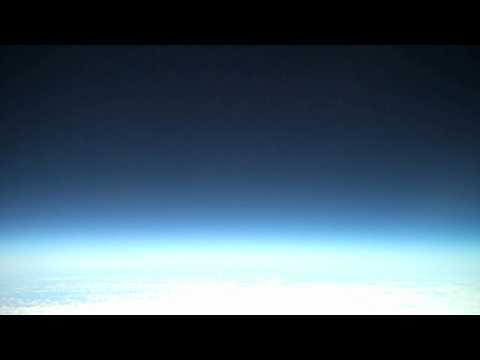 Not only did we launch a 12′ 3000gram Weather balloon in 25+ mph winds (stupid move on our part, BTW), we got some AMAZING images/videos from low orbit space. Our guesstimation based on what data we DID get from the handheld GPS providing altitude combined with what we know of the rise/lift in the upper atmosphere when there’s no wind present to alter our ascent, is we topped out somewhere between 95,000-105,000 feet. So that was our goal and we are confident we accomplished it. So how did it all go down, you may ask… well, let me recap the day, starting with prep. 11:15am – Arrive at Sodbusters field. Winds are insane and we second guess ourselves, but decide to go forth. 11:30am – We set up at the far end of the field due to concerns with the wind blowing us right into the power lines. C) prevent the balloon from flopping against any sharp surfaces in the are (ie: box corners, scissors, zip ties, dogs, sticks and grass. 12:05pm – The balloon is full to appropriate lift capacity, payload is ready for takeoff… now we wait for a slight break in the wind so we can get some height before the power lines. 12:15pm – We catch our break and let the guy fly. So, at that point we were on our way. We stood around and chatted, cleaned up a bit, etc. Then we hit the road. Considering the change in Jet Stream we didn’t want to get TOO far out again, so we stopped at that familiar Perkins in Menomonie, WI to wait it out. Just as we were getting the check, low and behold, the lil’ guy showed up on our radar and we were on the chase again. This time it was due east of Eau Claire, and as we discovered, nearly 3/4 mile out from the road, in the thick woods. After one rejection from a woman who did NOT want us anywhere near her property, we found another home, who’s owner was not around, but who’s buddy happened to see us and offered to take us as far back as his “deer stand” about a half mile back on the property. After about a good 45 mins of trucking through the woods, we finally found the guy and managed to make our way back out. Once we got back to the office, though, we discovered how fortunate we’d been. The balloon had snagged in a tree on the way down, and judging by the pictures from the iPhones running Time Lapse, we were stuck up there for about 20-30 mins before the wind pulled it down to the ground, where we so thankfully discovered it. Talk about a lucky break. So, now why was it more successful this time over the last? Well, we think a few key things made a big difference. 1. The larger ballon was a HUGE factor. Granted it was a near hellish experience trying to fill the thing in the wind today, but it made a big difference in the height we were able to achieve. 2. The addition of the SharkFinTail™ device really helped keep the payload spin factor to a minimum. 3. The addition of the desiccant packets clearly worked. We did get a little fog on the Flip Cam side for only a few minutes shortly after coming out of the clouds and hitting the higher altitudes. But once the desiccants starting kicking in, it was a clear shot of the deep dark space. 4. Lastly, the addition of the filling hose system coupled with the water jug just slightly heavier than our payload to indicate when the balloon had enough helium to achieve desired lift was another stroke of brilliant research on our part. Made the concept of “overfilling” pretty much non-existent. And what would be do differently, you may ask? Well, as with any project, there’s always a million things you’d have done differently if you could do it again (and you KNOW we’ll do it again). 1. We would’ve called it off for today and done it tomorrow. 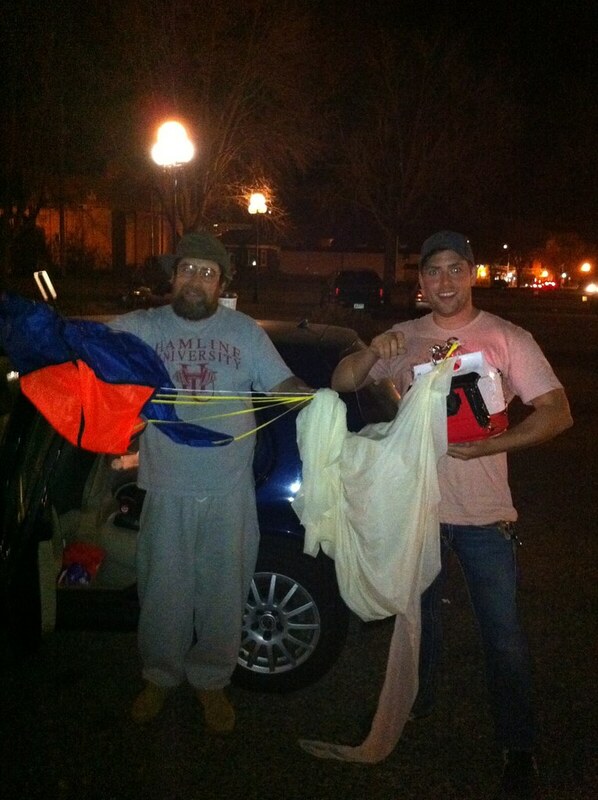 We’re damned lucky those winds didn’t tear our balloon or cause just enough damage to the balloon to shorten the flight. Additionally the clouds made the “downward” facing cam pretty pointless. We got some blurry shots of us as it went up, but everything after that is just clouds… pretty uninspiring. 2. We wouldn’t have forgotten to put the flashing light beacons on. We realized about 5 minutes after launch we’d forgotten those. We got lucky we spotted the thing when/where we did. It could’ve easily been nested in the thick brush we walked through plenty of to get there, and that beacon would’ve saved us. So anyway… enough babbling on about what we learned, blah blah blah… lets get to the good stuff. PICTURES AND VIDEOS! 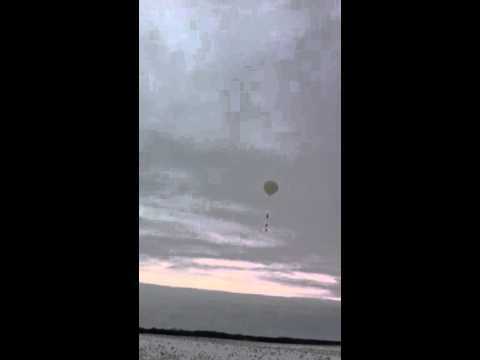 First, some great video from the Flip cam of a bit of the ascent, the upper atmosphere and the balloon burst. So there it is. A successful launch of a low-orbit space probe capturing images and tracking location all done with mobile technology. Thanks again to everyone involved and all who’ve so eagerly followed and written about our adventures. We couldn’t have done any of this without you all! Today is the official launch of the Yavin IV Low Orbit Space Exploration project. We’ve got as many of the kinks worked out as we can expect and we’re set to go higher than we’ve gone before! The jet stream has changed so we’ll be heading north of Eau Claire this time, but we’re expecting great results. Check in later for more updates! Gearing up for our official, real, final, whatever you want to call it, LAUNCH on Friday, September 24th from Sodbusters RC Airfield in Lake Elmo, MN. Anyone and Everyone is invited to come watch the launch. We’re excited as all get out! Today was out first un-tethered, “REAL” test run of the Yavin IV Low Orbit Space Exploration project. Everything went off without a hitch, we were up and flying by 12:10pm CST and our fear of losing our payload was squelched when we received contact from our device at approximately 1:42pm CST. We went up and down in just under two hours, as per our estimates. Our destination couldn’t have been any closer to our estimates as well. We landed just southeast of Eau Claire (seen here: http://twitpic.com/2pcgdh) in a small rural residential neighborhood. We quickly found our payload about 15 feet off the east side of a lovely home’s driveway nestled about 5 feet into the woods. We were easily within 30 feet of landing on their roof (yikes)! So from start to finish things went as well as to be expected. We didn’t get as high as we’d liked, we had some fog on the plexiglass sealing the holes we’d cut for the cameras, but we have solutions for all of that going into next week’s official launch. So, here’s what we got and here’s what we learned. – We over-inflated our balloon. We need to decrease the amount of helium we fill into the balloon to ensure it flies higher before bursting. – We need to seal the top of the cooler after loading the gear and prior to launch. The fog we saw on the plexi was due to an issue of the hand warmers inside and the cooler air seeping in. We’ll get better photos if we seal the lid tighter. – We need to try and find a way to reduce the amount of spinning. Our parachute lines were all twisted and a majority of the video is high pace spin… enough to make you nauseous. – We need to make the view holes larger to avoid any “cropping” if that cameras shift at all due to abrupt wind changes, etc. – Our GPS solution worked perfectly. Our biggest fear was that relying on cell signal and an app would yield shotty results. However, we were pleasantly surprised that it worked without a hitch. – Our estimation of travel time and distance were dead one. We will however need to take into consideration that the next payload SHOULD travel higher, which will of course alter both time and distance. So that’s what we got out of this. We couldn’t have asked for a better test run… aside from maybe not such an overcast day. Outside of that, perfect! See you next Friday for the second launch in the Yavin IV experiment. Not only is our first “real” launch today, but we’ve managed to garner the attention of the local Not only did we make the cut, but we made the FRONT PAGE! Wow, we’re quite honored. As the supplies roll in one UPS visit at a time, Friday’s test launch grows nearer and nearer. This test is simply to evaluate the Droid Eris GPS tracking capabilities (and Verizon’s claim of amazing coverage even in central Wisconsin) and will be launched from the Sodbusters RC field in Lake Elmo, MN. So this Friday, September 17th, we’ll be sending up our first payload carrying a Droid Eris for GPS tracking and an iPhone 3Gs for photos, since we’re going up un-tethered we might as well snap some shots, right? Our kit will consist of one 8′ weather balloon, one 4′ high-altitude recovery parachute (for the ride back down), one Playmate Mini Cooler, one Knog Boomer LED Bike light (as a tracking beacon in case it gets darker out), one Grabber™ Sleeping Bag warmer, one Droid Eris for GPS tracking via Loopt and one iPhone 3Gs to take photos via Time Lapse. So, check back this weekend for (fingers crossed) photos of the trip up/down as well as a full report of the days activities. You can also follow @Yavin_IV on Twitter for Real Time updates from the launch. We’ve just spoken with the FAA and set official launch dates. Our final live test will happen on Friday the 17th of September and our official launch of the Yavin IV project will happen the following week, Friday September 24th. Actual times to come soon!